Another (the 6th) large explosion seems to be occurring this morning at the volcano. 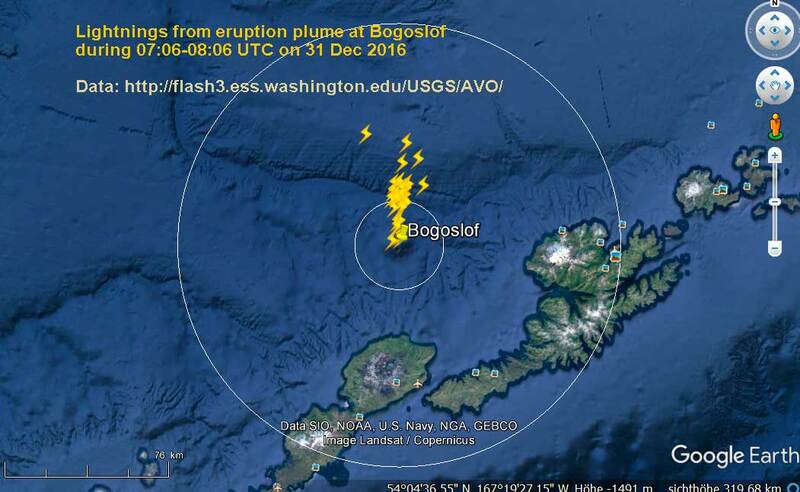 The Alaska Volcano Observatory reported detecting a strong seismic signal (captured on neighboring islands) and a swarm of lightnings typical for large eruption ash plumes near the volcano and extending north (as the ash plume drifts in this direction). Weather cloud tops at 30,000 ft prevent visual and other satellite conformation (so far) of the likely ash plume which could have reached similar altitudes. The eruption started presumably at 22:30 local time (07:30 UTC Dec 29) and is continuing at the time of writing.